What’s the first song you learned as a child? For North American kids of a certain age, their repertoire is that of Mother Goose. For their Israeli counterparts, it was author and illustrator Mira Lobe who set down on paper the music of childhood. As the child of an Israeli mother and an American father, I had the benefit of two sets of nursery rhyme books: Harper & Row’s hardbound English-language ‘Tall Book of Mother Goose’, illustrated by Feodor Rojankovsky, and a second, softbound Hebrew book stapled in the center like a pamphlet, whose illustrations, though far less sophisticated, nonetheless burned themselves in my brain. 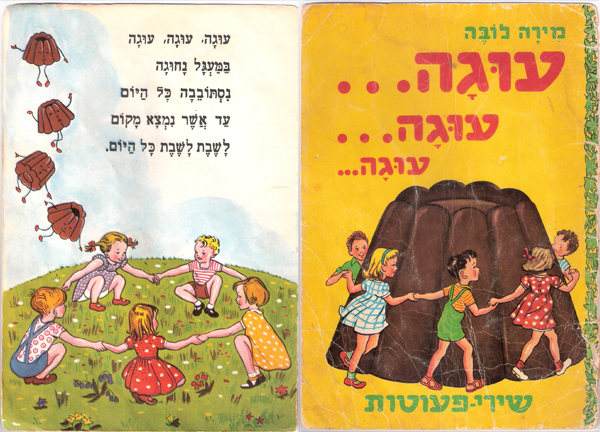 That book was Ooga, Ooga, Ooga (“Cake, cake cake”) by author and illustrator Mira Lobe, whose nearly 100 children’s books, it turns out, were imprinted on the memories of quite a number of children, not only in Israel, but Austria and Germany, too. Mira Lobe was born Hilde Mirjam Rosenthal on September 17, 1913, in Görlitz, Silesia (today Germany). Denied the opportunity to study art history, German language and literature due to growing antisemitism in pre-war Germany, she joined a Zionist youth group and in 1936 emigrated to Tel Aviv in pre-State Palestine, where she married to the actor-director Friedrich Lobe in 1940. In 1950, the Lobes left Israel and moved to Vienna, Austria, where Friedrich found work in the theater and Mira worked as a consultant to publishing houses while continuing to write and publish children’s’ books. In 1957, the family to moved to East Berlin as Friedrich had taken a position at one of the theaters in East Germany but returned to Vienna in 1958, when he found a job in the theater; sadly, he died a short time later that year. It was also in 1958 that Mira Lobe won the Austrian Children’s Literature Prize for her book Titi im Urwald (“Titi In the Jungle”). Lobe never stopped writing and in 1980 was the first to win the Austrian Children’s Literature Prize for an entire oeuvre. She died in Vienna in 1995, at the age of 82. The City of Vienna named a street for Lobe in 1997, and in September 2003, on the occasion of her 90th birthday, the Austrian Association for the Study of Children’s Literature convened an international symposium about her work. In 2013, the centenary celebration of Mira Lobe’s birth, a symposium was held at the University of Applied Sciences Zittau/Görlitzis. Her influence is still felt today in Israeli nursery schools and kindergartens where children still dance in a circle around an imaginary cake, singing “Ooga, ooga, ooga / Ba-ma’agal na-huga” (“Cake, cake, cake / ‘Round the circle we’ll celebrate”) until they all fall down.